This may be a hard thing to comprehend, but it is something I know. If you’re a science buff, you may remember that at the basic level, scientists can see a tiny charge that strikes like a lightening bolt between the two tiniest particles they can see with current technology. Ladies and gentleman, meet God. Albert Einstein taught us that ‘energy cannot be created nor destroyed- it can only change form.’ If this is true, then nothing ever really dies and everything has always existed. What a fantastic concept. Reality is based on our own individual perception. We only know the reality we directly experience. So I’d like to share one of my ‘surreal’ type experiences with you. My Dad’s side of the family came to America when he was only a young boy. They worked hard, and built a good life for themselves. In Italian culture, the center is always the family. Over the years we had traditions and those traditions were never compromised. Every holiday, even the ones that aren’t ‘real’ holidays like Labor Day, were spent with the family. My grandparents were so proud of their children and their grandchildren, and their love always showed. This photo was taken when I was about 12. 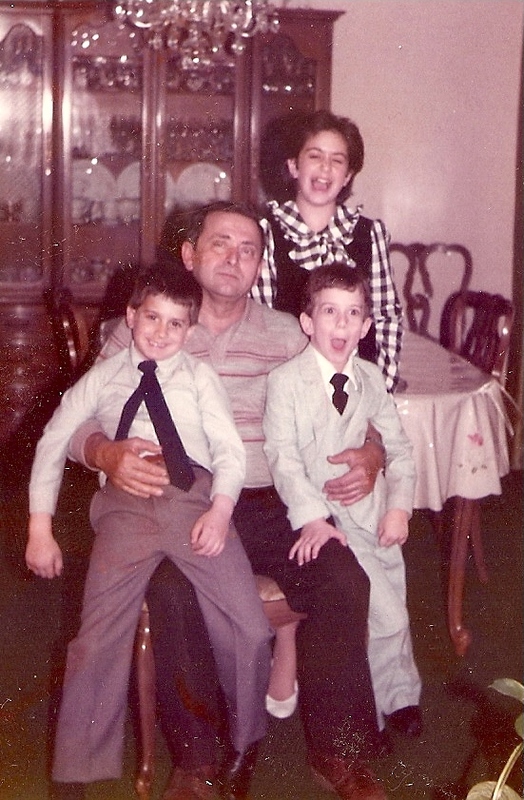 That's my Nonno in the middle and my brothers on his lap. His expression is so serious and we are all silly. It's one of my favorites because of that. Shortly after his visit to the bakery, he went into the hospital. He had a heart attack, and it wasn’t the first or the second. He was put in intensive care and we could only see him one at a time (because my Nonni wouldn’t leave his side). I remember going into the room and seeing him smile as soon as he saw me. By the sound of his voice you wouldn’t know anything was wrong. “Nicole! How are you?” he said. I looked at him and put my hand on his arm and said, “Nonno, I’m okay, how are YOU?” I was struck by how selfless and loving he was in that moment, as if I’d never noticed before. He said, “I’m all right, Nonno” (he sometimes called us that in return). After I finished telling her about the dream, she said this was his way of showing me how he is now, and brought through more information from him to us. He told us he’s healthy and vibrant now and not sick anymore. He also expressed that when he passed on, he was very surprised that he was ‘still there.’ How fantastic to think that he thought he was saying goodbye to all of us, only to find that he was still there and could still see all of us. I was a little shocked to hear it myself! With spirits, you never know what they might say or observe, and a lot of the time you hear things you’d never expect. Jackie said that he was very interested in my work and that he wishes he was more like I am when he was here. That made me cry, because of all the people who I would like to be like, it was him. He was content just being with all of us. We were the source of his joy. My Nonno was a gentle and kind spirit, who always thought of others before himself. He had a score of health issues, but you never heard him speak a word of them, nor did he ever indicate he was uncomfortable in any way. He was always grateful, and gracious. He worked hard all this life. Even after he retired, he still continued to work hard on the house and the garden, and spent as much time as he could with us, his family. Whenever we’ve had a reading with Jackie, he would remain in the background– until someone asks for him. Then he gladly steps forward. Jackie said when I asked for him, her people said, “oh, they want to talk to the quiet man.” Quiet, selfless, and yet brighter than a bright star in the sky. We will always love you , Nonno, and we will never forget what you taught us, just be being who you are. ~ by healingstarspirit on February 23, 2011. Thank you Nicole for sharing this story. My dad was the most gentle person you will ever, ever meet. Yes family meant everything and always came first to him as it does to me. I always wonder how is doing and hope it is better than the quiet misery he had to endure. He was happy just to be around and I hope he feels we all tried everything within our power to help him. Dad, until we meet again.